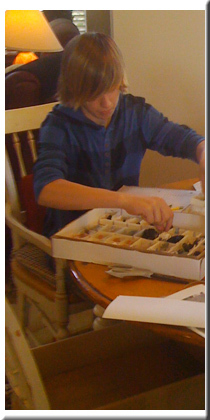 Here at the Crystal Vaults, we sell tumbled stones individually and in sets. 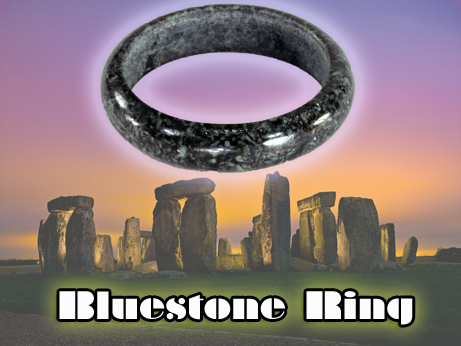 But either way, each stone is hand selected and energized through the concentrated Universal Life Force by the power of the inner stone ring of Stonehenge. They are all cleaned and spiritually cleansed prior to delivery. The metaphysical uses of each stone is clearly and completely explained in its listing. For healing, meditation, shamanic journeys, amulets of protections or talismans for bringing joy, success, enlightenment, trust, or other desirable elements into your life, these tumbled stones are absolutely the best available anywhere. The metaphysical uses of these stones are quite extensive. You will find suggestions in every listing. Now before I get started, just a note. You may have read differently, but let me assure you, polishing a stone, crystal or rock does NOT affect its metaphysical properties. In fact since the polishing process enhances the surface area it can often improve the Color Ray of Influence enhancing the energy transfer from the stone to our consciousness. OK, here's a question...You said you sell tumbled stones individually and in sets. Why? Most of our stones are in sets of six. Our reason is simple. Most all the Crystal Grid formations are based on the Flower of Life which has six pedals. So Grid builders often need sets of six stones. We try to provide these easily and economically. Now some stones are in sets of five. Five stones are the fewest, most efficient number of stones to provide the energy of the perfect circle that depicts and symbolizes the cycle of life. Five is the key circular number. Raising it to any power results in a number ending in five. In addition, five stones can form the pentacle, which like the circle, symbolizes and brings the energy of the cycles of life to any endeavor. Using tumbled stones arranged in a circle focuses and amplifies their energies. So...you need five of them to use them effectively. Now, there are exceptions. One, for example is Pietersite. It is sold in sets of four stones because it seems to work best when used in square grids with each stone focusing one of the four elements of Fire, Air, Water and Earth. And some are sold individually when th price of one is very high. So browse around - you should find what you need packaged the way you need it. Another question... what do you mean, hand selected? Every stone is hand selected. We do purchase lots of stones, but some are physically damaged, and some seem to be spiritually lacking, with dull, or defective energy auras. These stones are returned to the Earth to be recycled in the cosmic circle of life. Only stones that are physically and spiritually alive and undamaged are used at the Crystal Vaults. 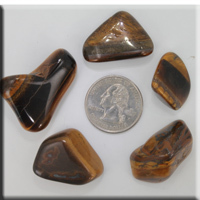 You are assured of high energy, and powerful Life Force in each of our polished stones. Tell me more about how your Tumbled Stones are energized with the Universal Life Force using the energies of Stonehenge. Does this make them more effective? As part of the earth, minerals and rocks contain some level of the Life Force of the planet Earth, a form of the Universal Life Force. Like we humans each has its individual strength and power, but like us they are more powerful when they are highly charged and energized. The Universal Life Force is an energy matrix that encompasses the spiritual world and the physical one. It runs through the past, the present and into the future,. Its energy is manifested to us through the sun, the moon and the earth. It is the energy of life. There is a place where the Universal Life Force is extremely powerful. It is a nexus, a connection point of the past and future, time and space; a place where the physical world and the spirit world connect. At such a place a crystal, rock or mineral can be more highlycharged with the power and energy of the Universal Life Force. That place is Stonehenge. Stonehenge is located at a major connection point of fourteen ley lines that join many of the most sacred places in England. And...it is arranged in a series of circles. The inner circle has the greatest power of concentrating the Universal Life Force. And it is not just Stonehenge's location that concentrates the Universal Life Force but the power of the stones of its inner circle...stones that were transported hundreds of miles...the rare and seemingly magical Preseli Bluestones mined in the Preseil Hills in Pembrookshire, Wales, the center of Welsh mythology, and home to Carn Ingli, the angelic communication center. While we cannot take every tumbled stone to the inner circle of Stonehenge, we have arranged to bring that power to the stones. Our stones are all charged and enegized with the Universal Life Force by contact with a circle of Preseli Bluestone which has been energized at Stonehenge,..a circle of concentrated Life Force...bringing you the most connected, energized, and potent energies possible. Do your tumbled stones, like crystals need to be cleaned, spiritually cleansed, awakened, focused and charged? Short answer: Yes. Like crystals the stones need to by physical cleaned. We do this step for you. They also need to be spiritually cleansed. When we ship a polished stone it does not contain any negative energy. However in transit it is possible for it to come near other commodities in the mail that may transmit such energies. We highly encourage our customers to properly cleanse their polished stones. 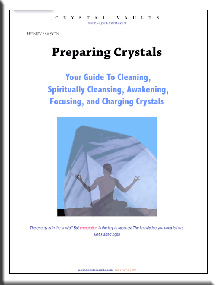 Our ebook, Preparing Crystals provides detailed instructions and illustrations of the 15 ways to use the Air, Water, Earth, and Fire elements to spiritually cleanse a crystal or stone. Our tumbled stones are fully charged with the Universal Life Force and should maintain their energy, depending on use, for at least a year or more. Recharging is simple, and again, our ebook, Preparing Crystals explains how to use the sun to accomplish this. So what uses are there for tumbled stones? Polished stones are used pretty much for the same purposes as most crystals. They are used in crystal healing, as meditation stones, for feng shui, and for amulets of protection and for talismans. They are also used in calling on the devine feminine in her guises as as Goddess. While many crystals can be somewhat fragile, most all tumbled stones are tough, and transportable. They are easily portable, durable, long lasting, and inexpensive compared to most crystals. So what is an "Aura Stone?" An aura stone is a tumbled, polished, usually somewhat larger stone that is specifically used in healing layouts to align and repair out of balance energy flows that affect the aura. They are also used extensively in Crystal Grid layouts that are focused on feelings and emotional issues that affect the auric health and spirit. So, we encourage you to use and benefit from the energies of these stones. You will be happy you did.